Why it is necessary to spend time planning for an asphalt pavement project. Asphalt paving projects require planning just like any other endeavor. Time and effort are necessary to plan out asphalt repair in Tampa in a truly detailed manner. It is important to know how to go about planning for an asphalt pavement project. A comprehensive evaluation of the asphalt’s current state must be performed prior to the actual work. This review highlights problem spots and budding issues that have the potential to compromise your parking lot in due time. Everything from faded paint to cracks, oil stains, heaving, and potholes are serious issues that must be tended to right away. There are all sorts of different approaches to asphalt repair. As an example, sealcoating safeguards asphalt from threats such as inclement weather, oil/gas drips, wear and tear from traffic, etc. Once your lot is sealcoated, the pavement will have a darker hue and will keep your asphalt protected for upwards of a couple years. Crack filling is another popular asphalt repair option. If you notice a crack that is a quarter-inch in size or larger, do not ignore it! Cracks will expand as time progresses. Even if the crack starts out small, it will eventually transition to alligator cracking. If the crack is neglected long enough, it will turn into a pothole and put the pavement’s surface at risk. If potholes form, patching will be necessary to fill them. Asphalt overlays are massive patching jobs stretched across a large portion of asphalt. This approach is used when current asphalt displays indications of potholes and/or cracks yet is not damaged to the point that a full replacement is required. Milling is performed when the sub-base is in good shape yet the top portion of the asphalt requires repairs. This process involves the removal of the upper layer of asphalt without compromising the sub-base. Do not immediately make a commitment to a certain type of asphalt when planning for an asphalt pavement project. There are significant differences between custom asphalt mixes, hot mix asphalt, cold mix asphalt, and porous asphalt. Custom mixes are specially designed for a specific type of asphalt. Hot mix asphalt is an asphalt mixture heated and subsequently poured at a temperature upwards of 350 degrees Fahrenheit. Alternatively, cold mix asphalt is optimal for filling potholes in the colder months as it repels water, sending it out of potholes to preserve asphalt integrity. Porous asphalt is asphalt with diminutive holes designed to ameliorate stormwater management. Water moves down below and passes through a cleansing process. Planning for an Asphalt Pavement Project: Don’t Forget to Budget! Experienced business owners anticipate pavement restoration will be necessary sooner rather than later. It is better to be safe than sorry by planning for an asphalt pavement project ahead of time. When it comes to planning for an asphalt pavement project, there is no better time than now. You can do your part to reduce pavement care costs by working with the industry’s best to perform preventative maintenance ranging from crack sealing to sealcoating and beyond. Our parking lot maintenance team is here to bring out the best in your asphalt. 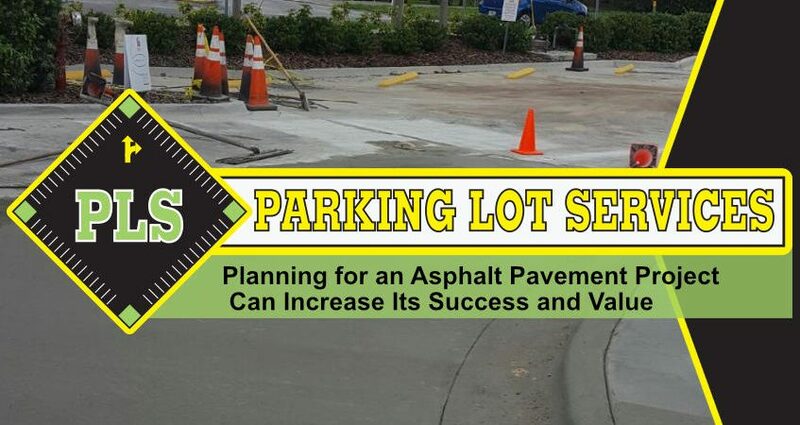 The team at PLS will customize a unique asphalt paving plan for your property. Contact us at (813) 880-9100 to learn more about our services and schedule a no-cost consultation today.